While winter still sends its cold breath across Northern Europe, the countdown for this summer’s world-class football in Russia continues. Among pitch managers and chief groundsmen, expectations for perfect tournament pitches are sky high. The organizers, the players, and billions of football fans across the world expect nothing less than beautifully green and hard-wearing grass; the groundsmen will do their utmost to make it happen. Everyone wants to see their team in the finals – including us. For summer 2018, DLF turf-grass technology and innovation will once again be central to much of the play. Three months before kick-off, DLF sports turf grass is in demand at most of the 12 match stadiums and the majority of the training pitches and base camps. Our grass seed and genetics are the preferred choice for Russia football stadiums based on our success at previous World Cups: South Africa in 2010 and Brazil in 2014. Click here to see our reference list of match stadiums. Since all 32 qualifying national football teams will play on natural sports surfaces, the focus will be on pitch quality. Every stadium will be different because local sub-constructors and chief groundsmen choose the grass for the pitches in their care. Recommendations from sports consultancy, STRI, and the Local Organising Committee will support local decisions. Each match stadium also has three training pitches, which, according to official guidelines, should have the same grass surfaces as the match pitches and be in perfect condition. Across the world, DLF varieties are in demand for new pitches, sod/turf rolls, and overseeding. In Russia we're the best represented seed company with more than 100 turf grass varieties listed in the Russian official state variety list. At all stadiums, the final appearance will be determined by the overseeding procedure and the skills of the pitch management teams. That's what creates a high-density grass sward with erect and inviting green grass blades. All Russian stadiums will be overseeded during the spring with perennial ryegrass. Most will choose mixtures containing traditional diploid perennials and new 4turf® varieties only available from DLF. Our enhanced 4turf®perennials germinate faster than traditional varieties and are developed especially for rapid installation and unique stress tolerance. They're especially suitable for the Russian climate because they exhibit fast and strong establishment at soil temperatures as low as 3°C. Kazan Arena was seeded on 20 January with a mixture of Poa pratensis and perennial rygrass, including 4turf®. 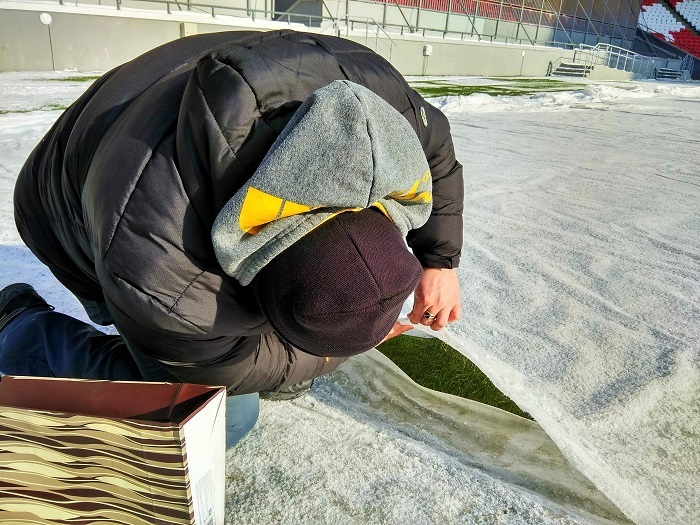 Heating systems in the ground make it possible for the grass to establish, and the covering material protects the seedlings - in early March it was down to -25°C.